We are pleased to deliver table of contents alert for Clinical Archives of Communication Disorders. 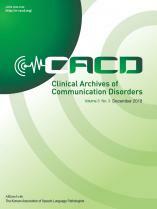 Clinical Archives of Communication Disorders Open access articles are now available at http://e-cacd.org/. 192 Do Scores on an Attention Test Predict Scores on Executive Function Tests? 246 Daily Emotions and Stuttering: What Is the Relation? Copyright © The Korean Association of Speech-Language Pathologists. All rights reserved.